Luxurious, velvety texture. Lightly sweet with a smooth buttery flavor. That's what makes Swiss Meringue one of the most requested frostings in bakeries throughout the world! Learn how to make this amazing buttercream yourself by following this simple recipe tutorial below. Enjoy! To begin this recipe, we must first heat the egg whites and melt the granulated sugar. 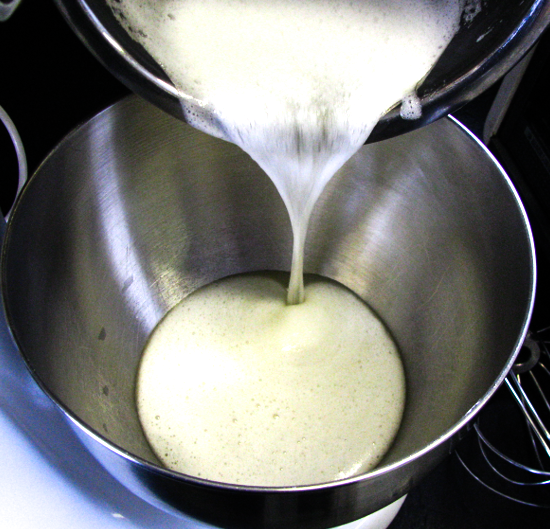 To do this, we must place the egg whites and sugar in a double boiler. If you do not have a double boiler, place the whites and sugar in a heat-safe bowl and place over a pot of simmering water. 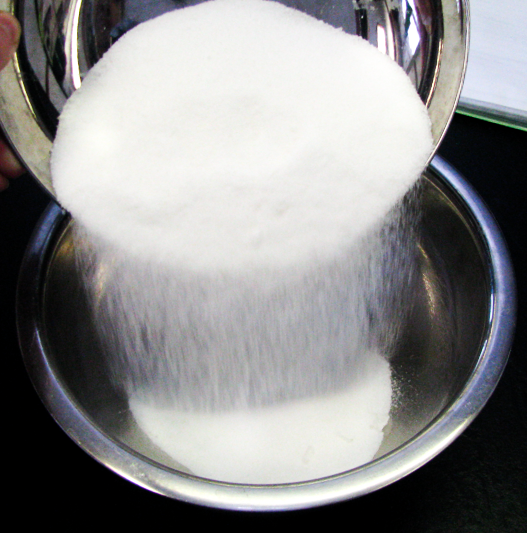 Pour 12 ounces of granulated sugar in a heat-safe bowl or the top pan of a double boiler, if using. Next, add 7 ounces of egg whites to the granulated sugar. Place the heat-safe bowl over the pot of simmering water and stir egg white/sugar mixture constantly. Heat the egg white/sugar mixture to 140 degrees. 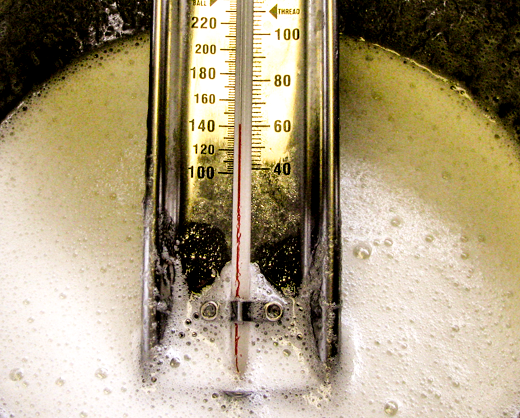 Test the temperature of the mixture with a candy thermometer. 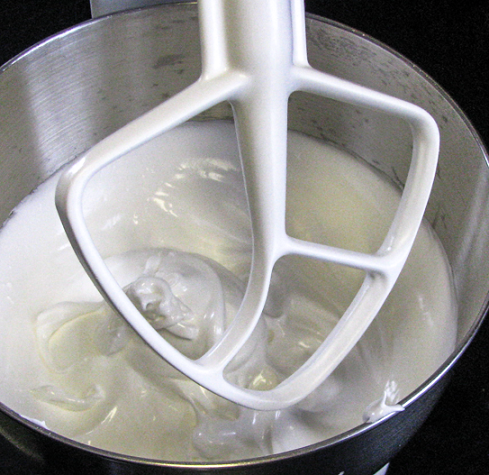 Pour the hot mixture into the bowl of a stand mixer. 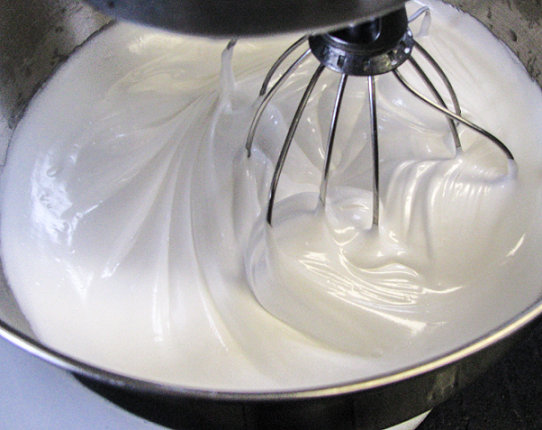 Using the whip attachment, whip the egg white mixture on medium high speed until meringue is light and fluffy. Meringue is finished mixing when the meringue's ripples hold their shape when the mixer is turned off and meringue is at the "soft Peak" stage. Let meringue cool to near room temperature. 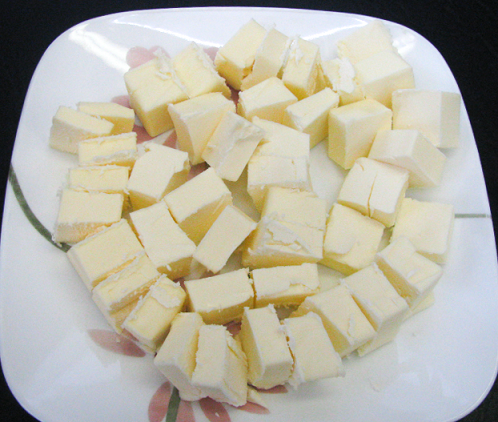 While meringue is cooling, cut 16 ounces of cold unsalted butter and 4 ounces of cold salted butter into small pieces. Also set aside 4 ounces of high ratio shortening. Leave at room temperature until ready to use. Note: You may use all butter for this recipe instead of shortening. Shortening allows for the buttercream to be more stable and hold up a little better in warm weather. Remove whip attachment and attach paddle. Once meringue has reached room temperature, it's time to begin adding the butter and high ratio shortening. Mentally divide the butter and shortening into three parts. 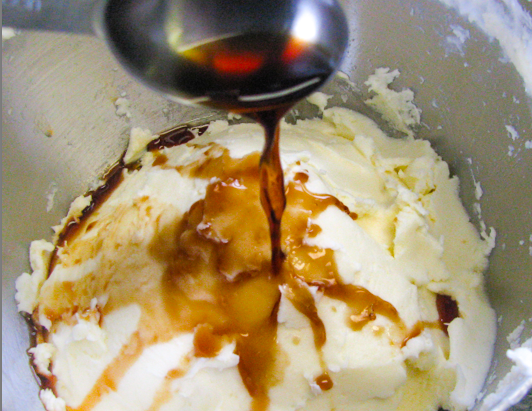 Add the first third of the butter to the meringue and mix on "stir" speed on the mixer for about 20 seconds. 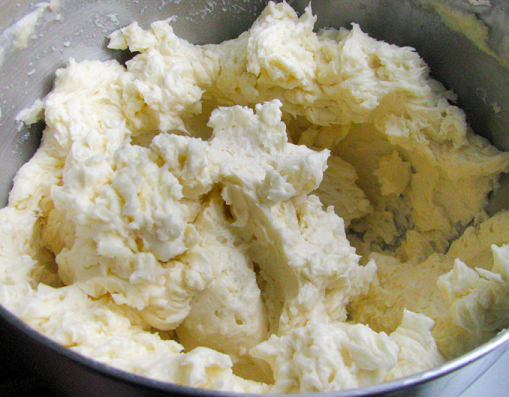 Add the second part of butter to the buttercream and mix on "low" speed for about 30 seconds. And finally add the last part and gradually increase the mixer speed to "medium high" speed. Mix buttercream until butter pieces are well blended and buttercream is light and fluffy. Be careful not to over mix! Next, add 1 tablespoon of pure vanilla extract. Scrape sides of bowl and blend on medium high speed until well mixed. Now you have a beautiful batch of silky Swiss Meringue Buttercream! Swiss Meringue is a non-crusting buttercream that smoothes beautifully. 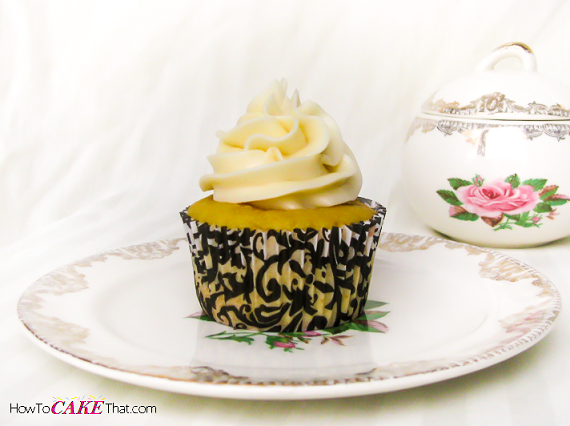 It is also sturdy enough for piping on cakes and cupcakes, and also will hold up well under fondant. If this frosting will be made in warmer weather, keep any goodies decorated with Swiss Meringue Buttercream in a cool environment - Swiss Meringue melts easily! Enjoy!